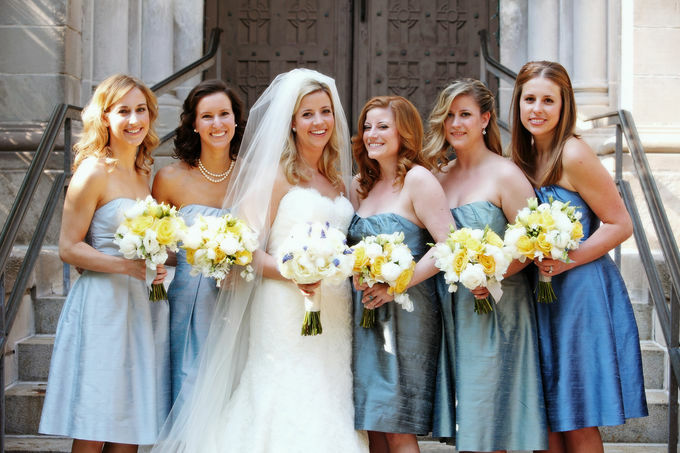 Coordinating your bridesmaid’s hair and make up so that it compliments the bride’s hair and look can be difficult. Not everybody has the same face shape, hair texture and length. Also, some of your bridesmaids might have big personalities and they might not want a hairstyle that the bride thinks compliments hers the best! It is the bride’s big day so her closest friends and sisters shouldn’t have a problem with completing the picture perfect day with a hairstyle that compliments the bride and the weddings theme. One way to have your bridesmaid’s hairstyles compliment the bride are to have the bridesmaid’s wear the same hairpiece or hair pins that match or even contrast your hairpiece. This way, hair can be worn up or down, long or short and everything is still coherent and pulled together with the hair accessories. 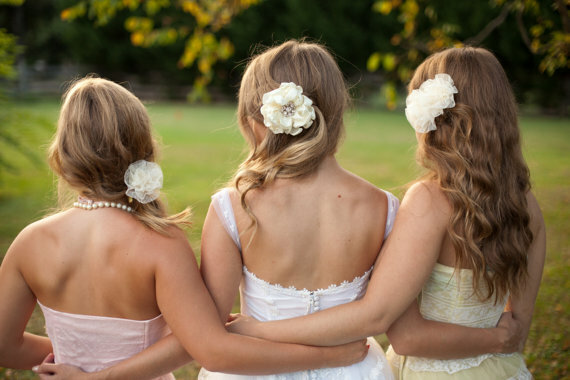 Matching bridesmaids hair accessories is the perfect way to bring hairstyles together. If it is possible, every bridesmaid can wear the exact same hairstyle that compliments the bride’s hair and her taste. Of course the bridesmaids hair should match their dresses and hair type. However, if some of your bridesmaids have short hair, and some have long tresses then don’t worry about it, there are plenty of other ways for your bridesmaid’s hairstyles to inspire and compliment the bride. Matching bridesmaid hair is cute and traditional. As a bridesmaid, if you are not given direction for your hairstyle or you are given the freedom to style as you wish, don’t forget to consider the theme and style of the wedding. If the wedding is at the beach a bridesmaid should wear her hair so that is reflects that relaxed, calm theme, while if it is a very formal wedding then a polished up-do is more appropriate. If the bride is wearing her hair down, soft, and relaxed then it is a good decision to keep with that theme with the bridesmaid’s hair. If the bride has loose soft hair and the bridesmaids have tightly pulled back traditional up dos, the hairstyles clash. Always match your bridesmaid hairstyle to the weddings theme. Chances are, the bridesmaids are all wearing the same dress therefore the same hairstyle is going to compliment the dress the best. Backless and low cut dresses generally look better with up dos. Strapless gowns look great with both up dos and down. An off the shoulder dress looks great with hair half-up and half-down. Hairstyles should match the bride and the dress.